There are many styles and types of baskets. I like to have a mixture of baskets in my home. If I like look of a basket, I’ll get it! I tend to like the older baskets that have the warm patina to them as well as any basket that has an interesting weave. I recently found this great round basket at Pier1. The weave and dark color are beautiful. 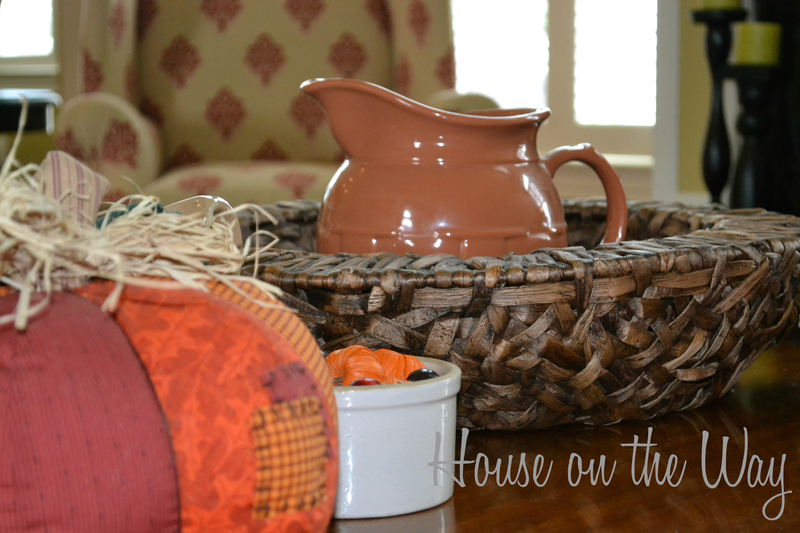 Here I’ve used it as a tray on my coffee table to highlight my Fall decor. Have you ever had those moments, when you finish a DIY or project and you say, “YES! That’s awesome!” I had one last night! Do you love lighting as much as I do? Is the lighting one of the first things you notice when you walk in a room? I think lighting is such an important part of our home and yet it’s often what we give the least amount of thought when decorating. Sometimes it’s as if it’s an afterthought. The lighting we choose not only accentuates the space, but sets the mood for the entire room. The eggplant is to die for! What a fun and whimsical color! That lamp speaks for itself…and it says, “I’m beautiful!” The inspiration for these lamps was an oversized wine jug. They have a mottled texture. At PB there are a variety of shades that you can pair with the lamp base. Remember, the shade is sold separately. Take a look at the Gourd lamps from West Elm. I love the curving form of the hand blown glass base. They provide a very unique and exciting look. The colors available are Charcoal, Clear and Luster. Gorgeous! Bonus ~ They come with the shade. Don’t want to fork over $149 + for a Glass Bottle Lamp? You can DIY! Aaron from The Thrifty Abode gives a great tutorial on making a home-made Pottery Barn/West Elm lamp knock-off. She provides instructions and pics showing how to drill a hole in the bottle for the cord and tells you exactly the supplies you need, which she got at Lowe’s for $18. Look at her finished product! Pretty awesome! If you do decide to DIY, be sure you study up on how to do it correctly! Check out Google and Pinterest. There are tons of ideas, Youtube videos and instructions on how-to DIY your own Glass Bottle Lamp. Lamp kits are available at Lowe’s and Home Depot or you can even take your glass bottle or vase to a lamp shop for conversion…let them do it! The great thing about these lamps is that they are so versatile. They can fit in with just about any style of decor and if you choose a base in a clear or neutral color, you only need to change out the shade when you re-decorate! Whether you choose to purchase your Glass Bottle Lamp or make your own, you can rest assured that it will definitely light up your life. On a separate note…I want to give a big shout out to Amanda at The Little Giggler for featuring my Headboard Makeover. 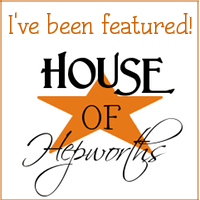 I am honored and so excited to be featured! Stop by and visit Amanda’s blog and visit her new shop, The Little Giggler Shop, where she sells some of her handmade goods. Very cute! It’s a brand new day and another Window Shopping Wednesday! Yesterday, I actually went out shopping for fabric. I’ve gotten a wild hair and decided to make some changes to my bedroom. Anyways…no luck with the fabric…but I did find my inspiration for WSW! As you know, Hancock Fabrics has all your sewing needs plus a bit of home decor. They always have a good selection of seasonal decor too. Another good thing about Hancock Fabrics is that most of the time, it’s on sale. Yesterday, all the seasonal decor was 30% off. One thing that I’ve noticed this year is the trend of the non-traditional pumpkin. I use these unique pumpkin baskets every year. Gone are the days of the fake plastic pumpkin! 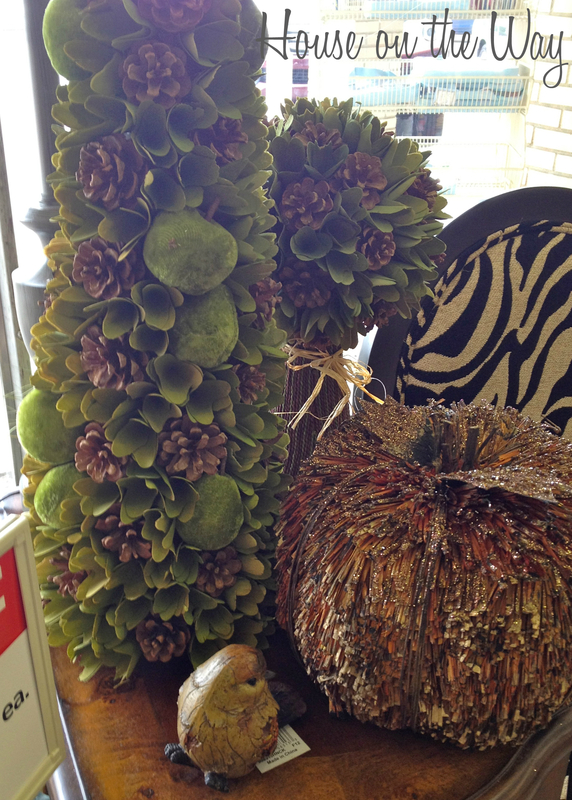 Embrace the pumpkin of many textures…Look at the great pattern found on the green one on the left! 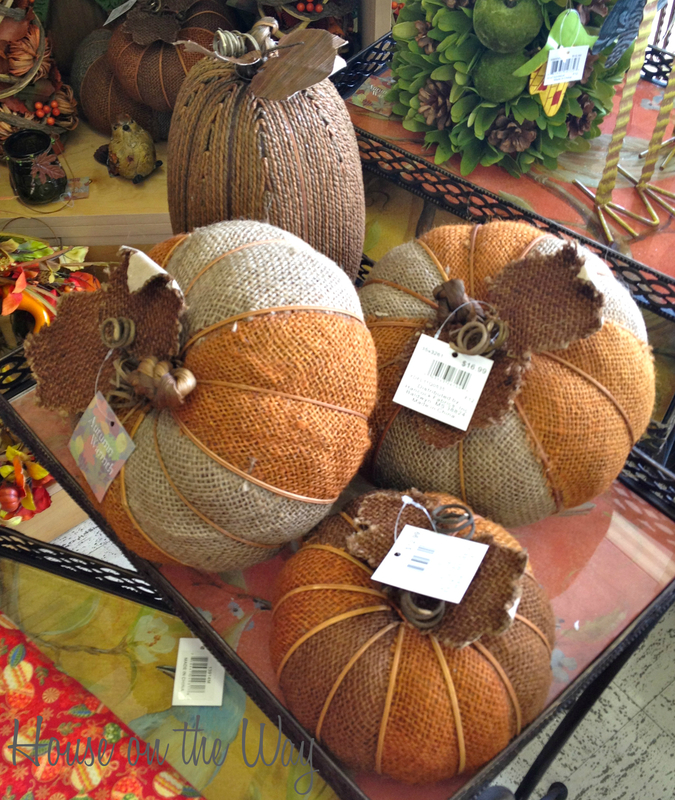 The multitude of textures found in these raffia pumpkins are awesome! Texture is very important in your decor. It brings interest into your space. They range in price from $9.99 to $24.99, based on size, but don’t forget that they were 30% off! The raffia pumpkins are definitely nontraditional. I love the rich colors! The deep, warm tones will give your fall decor a new, updated look. They would look beautiful with navy, yellow, or even red. Think about your home decor and choose Fall items that will give you the look you want, to express the season, but will also complement your existing decor. Sometimes, orange is not the answer. Greenery is always welcome! I love the size and shape of this topiary. It is $39.99. 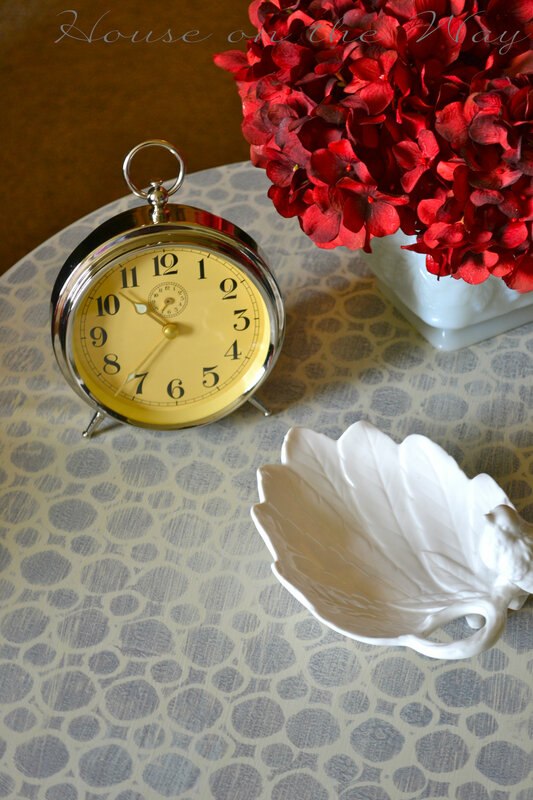 The good thing about this piece is that you can use it for your Fall decor and then use it the rest of the year! This would look awesome amid some baskets filled with pumpkins and gourds. Here are a couple of other topiary that include some pinecones and green apples. They are not my favorite, but could work in the right setting. Check out the pumpkins make of twigs! Personally, I don’t care for the glitter on top, but the fact that it’s made from twigs is really cool. 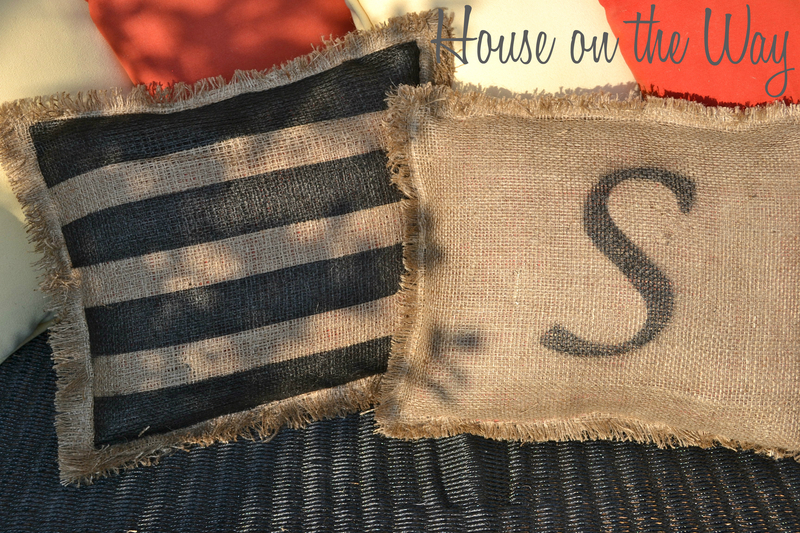 Another trend that is hot right now…burlap! 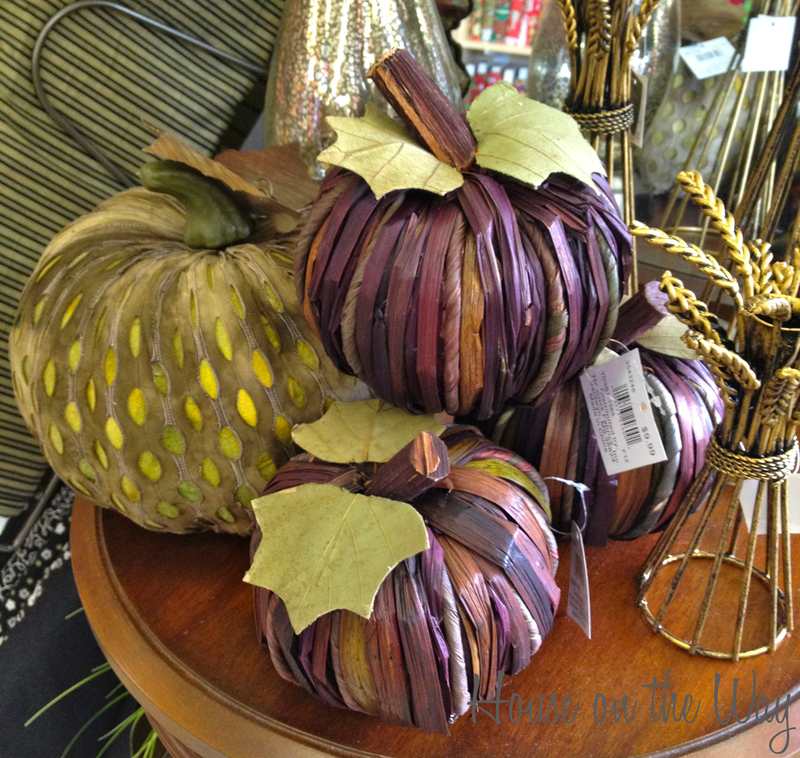 The burlap pumpkins below can give your home a classic Fall look, with the update of the burlap. They provide a more “country” look, but I don’t think you need to only have that style in your home to be able to use them. The detail is excellent. They also range in price from $9.99 to $24.99. Okay…these next guys are not pumpkins, but they are cute! Aren’t they awesome? Owls are everywhere! They are entirely made from twigs, leaves and other natural materials. Their eyes are very interesting. I’m not 100% sure, but I think they were around $12.99 each. (Sorry, but I can’t remember.) 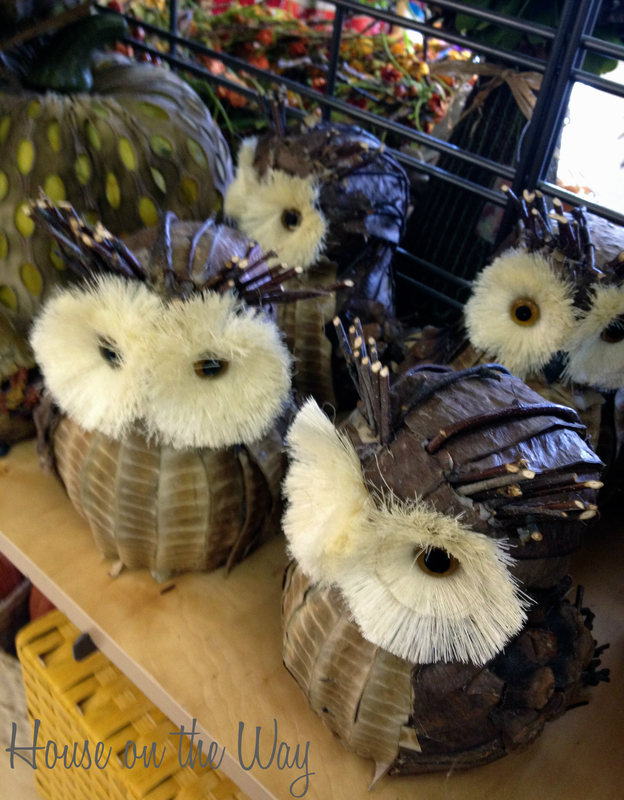 These owls could be used for Fall, Halloween and Thanksgiving! 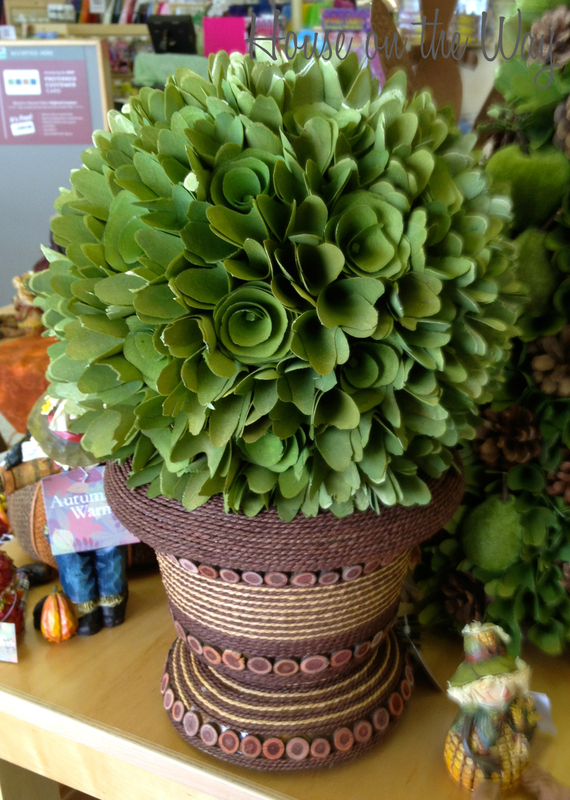 I encourage you to take advantage of the current trends and use some of this new, unique Fall decor in your home. Some of it could make for some great DIYs! Check out Google and Pinterest…there are some great ideas and tutorials out there! If you’d rather not DIY, head to Hancock Fabrics. 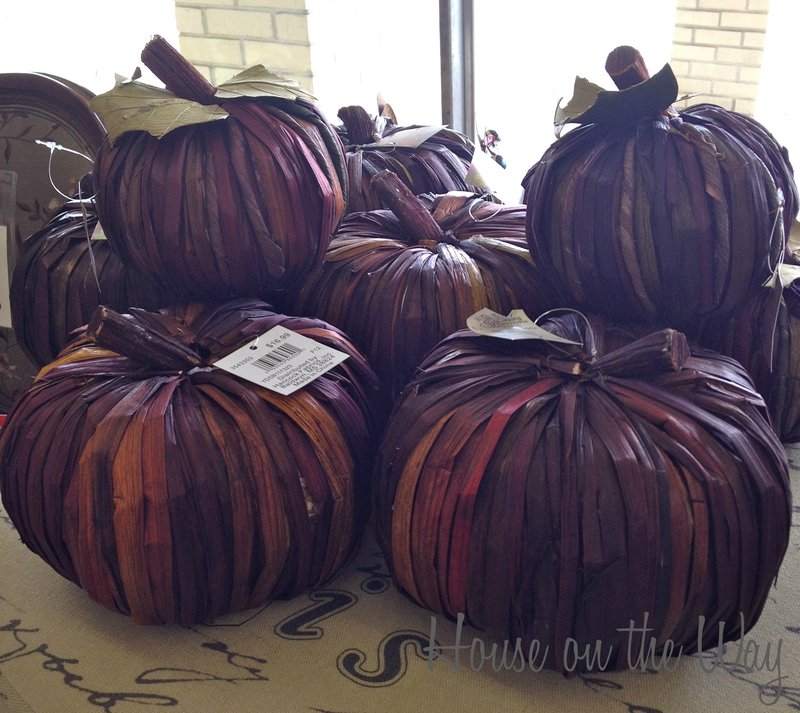 They have some great Fall decor that will fit your decorating needs, at a good price! Wow! What a great collection of ideas and projects from some awesome bloggers! Thanks to everyone who linked up and shared with us all! 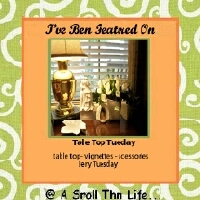 My features this week are three amazing furniture transformations! In fact, I sort of have a “dresser” theme going on today. Keeping looking and admire the creativity and talent of these great bloggers! This dresser makeover by Karin at Art Is Beauty is absolutely gorgeous! The artistic detail of the fern that she and her cousin painted is beautiful! I love how it trails onto the top of the dresser. It is such a stunning piece! One-of-a-kind! There are some lucky girls at the home of Kylie at Kylie M.Interiors! She took this great armoire and turned it into a gorgeous, bright organizational center for her girls’ princess clothes! I love the pillows and the combination of the other bright colors with the piece. This dresser transformation by Meg at Never A Dull Moment shows us the result of beautiful chalk paint and some hand painted detail. I love that she left the drawers and top a dark wood color, while painting the dresser frame the beautiful green color! Stop by her blog and check out the inside of the drawers! 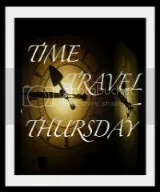 *You must link back to my blog using this link or my button found on the sidebar. *By linking up your post, you are giving House on the Way permission to use a picture as a feature on the blog and other social media outlets. Each week I will also be featuring a few outstanding inspirations from the week before. Last week was my giveaway for a set of 6 Oneida Barware Coasters. Have you shopped with Oneida lately? 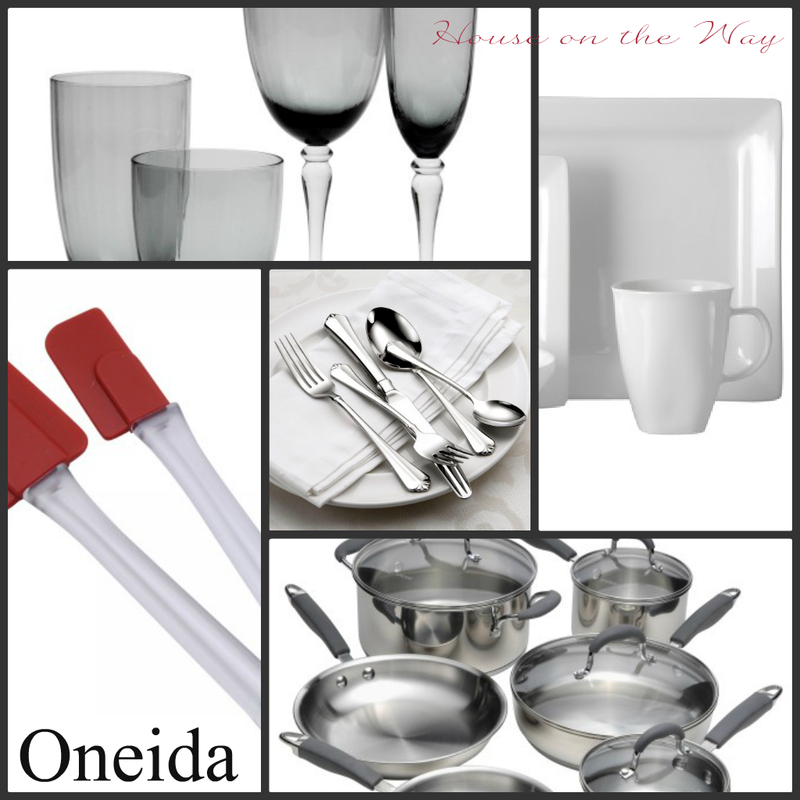 Take a peek at Oneida’s website for all your tableware needs. Oneida is having their Labor Day Special with 20% off your entire order until Sept.5th! Stop by their website! You can find the coupon code below and on their site. 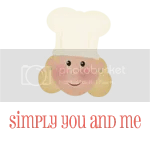 Visit Simply You and Me and visit Dana! Such a cute blog! Congrats Dana! Does The Makeover Need A Makeover? Have you ever started a DIY project and was so excited about it, only to slowly deflate as the project progressed? ?….Let’s discuss my adventure in the end table makeover…or is it the end table nightmare?! A couple of weeks ago, I found this cute little end table at a yard sale for $20.00. It’s nothing fancy, but it is sturdy and I like the somewhat oval shape of the top.